The study “Building in Your Backyard: Affordable Land for Affordable Housing” developed a program for new affordable housing to be built on existing under-built New York City Housing Authority (NYCHA) estates. It was funded with grants from the National Endowment for the Arts and the New York State Council on the Arts. Through a process of extensive site surveys and zoning analyses, significantly under-built NYCHA properties were identified. Additionally, analyses of the City’s traditional neighborhoods revealed urban design conventions that were then used to redesign three representative under-built housing estates with infill housing building types. These design conventions included: 1. Reasserting street patterns by breaking up super-blocks into smaller components blocks; 2. Using buildings to define open spaces; 3. Developing a hierarchy of open spaces from public to private; and 4. Developing a unique “sense of place” by designing a diversity of spaces, each with its own scale. 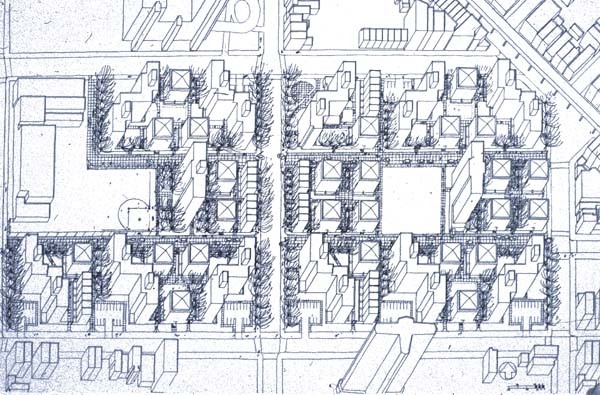 The concept of introducing low-rise infill housing into under-built NYCHA estates provided an opportunity to reclaim the alienating “tower-in-the-park” by reasserting its connection with the neighborhood context, as well as providing much-needed low income housing.